Following the radical changes in the Budget introduced by chancellor George Osborne for those looking for income retirement annuities still represent good value compared to other options. The significant change in the Budget means it is not necessary to purchase an annuity and from April 2015 it will be possible for people to take the full fund out as cash less marginal rate tax. For smaller funds under £30,000 the Triviality rules have been changed allowing these fund sizes to be taken as cash less tax from 27 March 2014. 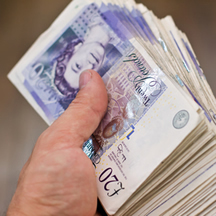 The annuity market is worth £12 billion per year from about 400,000 giving an average fund size of £30,000. Many people retiring will therefore consider taking these smaller funds paying the tax rather than take an income from an annuity especially if they intend to use the capital for other purchases such as a holiday, new car or to give to their children possibly as a deposit for a flat. If income is a priority it will be difficult to match the guaranteed income from a retirement annuity. For a person aged 65 the 6% per year annuity income is currently twice the level of the possible 3% interest from bank and savings alternatives. The following chart shows the effect of tax for a pension fund of £50,000 after tax free cash of £16,666.67 is taken. Any funds removed from the pension environment are likely to be taxed as only the first £10,000 allowance of annual income is free from tax free. Many people will also receive the state pension and other pension income could absorb this amount. The next £31,865 is at basic rate tax of 20% and thereafter higher rate tax at 40% applies. From the £50,000 basic rate tax would reduce the fund to £40,000 and higher rate tax on the full fund would reduce this to £30,000. To avoid higher rate tax, the £50,000 fund would need to be split across two tax years. As the new rules would be introduced from April 2015 this would mean using the tax years 2015/16 and 2016/17 to avoid paying higher rate tax on this fund. The following chart shows the income received after the payment of either basic rate or higher rate tax. 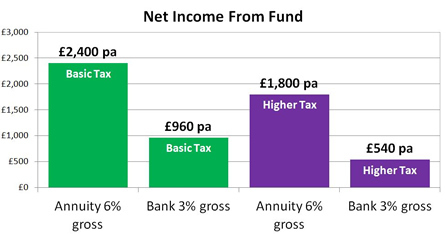 For basic rate tax payers, the £50,000 fund for the annuity would provide a 6% gross income or £3,000 pa based on a single life, level annuity and after 20% tax this would reduce to £2,400 pa. 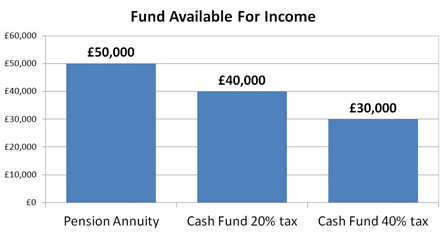 If the fund was removed as a cash fund with basic rate tax paid, the £40,000 fund could receive interest from a bank of about 3% gross or £1,200 pa and after 20% tax this would reduce to £960 pa.
For a 40% higher rate taxpayer the net income for the annuity would be £1,800 pa. If the fund was removed as a cash fund with higher rate tax paid, the £30,000 fund could receive interest from a bank of about £540 pa. 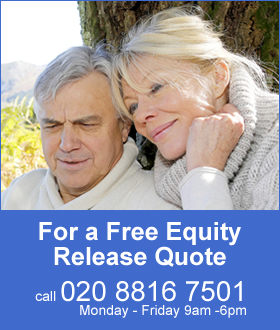 The annuity still provides significantly more guaranteed income than removing the fund from the pension environment where interest from a bank is lower and may have to be sourced every year to find the next best interest rate provider.